Frequent rains and gloomy clouds, the days have been really chilly at my summery corner of the world. I would never have turned down an ice cream treat, but ...brrr! These are days I cuddle up with hot tea, chocolates and meals that bring warmth to the body, like curry. Curry has been playing on my mind. I was on my sofa nicely tucked under a blanket. I hadn't really wanted to do anything but I had to eat. Heh! So, off I went to see what was in my fridge. And that's how I landed myself with a cauliflower curry. I had both cauliflower and pumpkin to clear off. I got into the groove once the cutting and chopping started. An hour later, my curry dish was ready and I was gleefully scooping huge spoonfuls onto my plate of rice. This, to me, is comfort food! Here's how I made this. Note: Add a bit of water to the curry paste, if too dry. 1) Heat oil in pan. Saute onion and garlic until lightly browned. Add curry paste, bay leaves and star anise. Stir-fry until paste is a darker shade of red or until oil separates. 2) Add pumpkin and cauliflower. Pour the coconut milk in. Season with salt and pepper, and stir until all the ingredients are well coated. 3) Add water. Simmer covered on lower heat until pumpkin is smashed and the cauliflower is cooked. 4) Switch the heat off. Stir fresh coriander in and serve! 1) Ingredients 2) Sauteing onion and garlic. 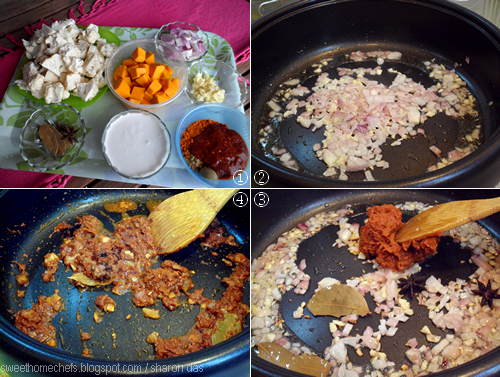 3) Adding in the spices and curry paste. 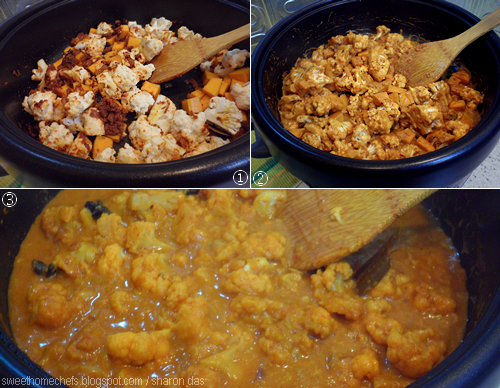 1) Adding pumpkin and cauliflower into the mix. 2) Mixing the coconut milk in. 3) Add water and cook until pumpkin is smashed. There you have it, served with fresh coriander. It's great with rice and oh-so-perfect with roti. 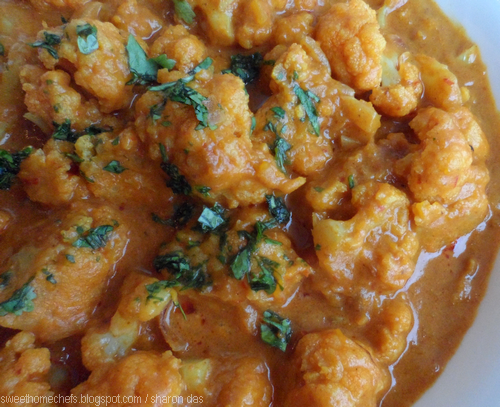 Cauliflower Pumpkin Curry ..dig in! I would lick the whole bowl clean! It looks so flavourful, warming and tasty. Happy Holidays to you and yours, Sharon! oh my god pumpkin curry! Happy 2015, Emily ..and thank you! 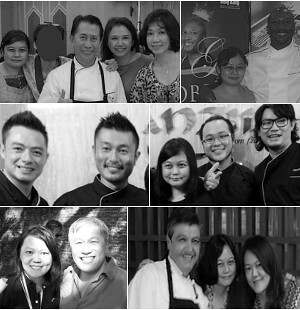 Hope you're having a great year! That looks yum! I love the addition of coconut milk but my husband isn't fond of it. Otherwise that's how we have our vegetable curries too. Love the combination. 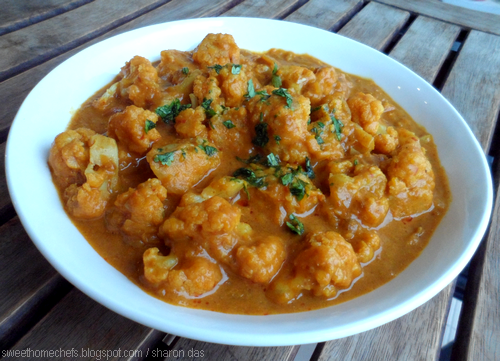 A new & delicious curry.................cauliflower & pumpkin interesting combo. 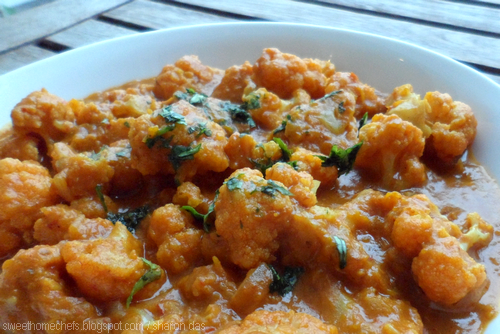 Happy New Year Sharon...this cauliflower, pumpkin and curry just sound delicious! Certainly some great looking dish, Sharon! A great alternative to the usual cooking. This sounds like a delicious and different veggie dish! I had a Thai pumpkin curry for the first time on my birthday last year and it was fantastic. In India we have a variation on pumpkin curry too that is more sweet. Seems like pumpkin curry is pretty popular, but incorporating cauliflower into the mix sounds like a great idea. This dish sounds sweet, spicy and absolutely delicious!